间脑位于中脑的前上方，大部被大脑半球所遮盖。 Located in the brain between the brain before the top, most are covered by the cerebral hemispheres. 主要有背侧丘脑、下丘脑、上丘脑、后丘脑及内、外侧膝状体等。 Mainly in the dorsal thalamus, hypothalamus, the thalamus, hypothalamus and the medial and lateral geniculate body and so on. 是一对卵圆形的灰质团块。 A pair of oval gray matter clumps. 分为前、内侧、外侧三个核群。 Divided into before, medial, lateral three nuclei. 腹后核：位于外侧核群，是躯体感觉传导通路的中继站。 After ventral nucleus: in the lateral nucleus of the group, is the somatosensory conduction pathways relay station. (1)视上核：分泌加压素。 (1) Depending on nuclear: the secretion of vasopressin. (2)室旁核：分泌催产素。 (2) the paraventricular nucleus: the secretion of oxytocin. 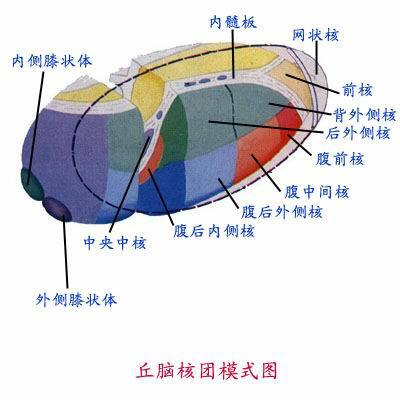 是位于间脑正中的矢状位的裂隙。 Is located in the middle of the brain between the cracks sagittal. 借室间孔与侧脑室相通，借中脑水管与第四脑室相通。 Between the hole and the lateral ventricles communicate through the room, through the cerebral aqueduct and fourth ventricle connected.